Ever wonder why the top poker pros in the world always seem to know exactly what their opponents are holding? Or why your favorite player felt so confident with his pocket fives and was able to get his opponent with an AK suited to fold? Poker strategy has a lot to do with it. If you’re new to poker tournament strategy, it’s time to learn the basics. By learning about things like pot odds and implied odds, not to mention how to read a bluff, you could end up owning the felt in ways you’ve never imagined. Get poker strategy on your side and start thinking like a pro. And when you’re ready, apply what you’ve learned online at one of the top poker sites we recommend. Poker has more variations than Baskin Robbins has flavors, so it can be tough to be an expect at each and every one. If you’re just looking to dabble in the many brands of poker, you don’t need to know every in-and-out. You just need to know the gold rule. 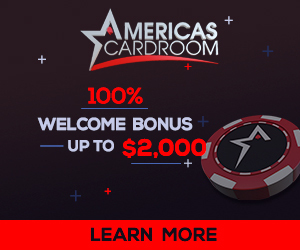 Texas Hold’Em is the most popular poker variation, thanks to the poker explosion in the 2000’s and the vast coverage around tournaments such as the World Series of Poker in Las Vegas. There are a number of tips and tactics to remember when playing Hold’Em but perhaps the most important rule is don’t react to your hand – good or bad. Texas Hold’Em is all about reading your opponent and not letting them read you. So if you draw a strong hand, keep you composure and cool and try to hold back that smile, as not to scare away the other players. If they sense something is up, they’ll likely fold and leave the pot light – wasting a winning hand. On the other side, don’t show your disgust when drawing a weak pair. For all you know, those others at the table are holding bad hands as well and a little fake bravado could spook them into folding. Sometimes known as draw poker, stud poker deals the players five cards and they’re allow to discard and draw new ones to make a stronger hand. Due to that rule, most players can build a respectable hand and that makes it very competitive. With that in mind, if you don’t have a good hand, fold up and fight again another day. You don’t have to bet into every hand and knowing when the odds are stacked against you is probably the best tip you can utilize when playing stud poker. There’s nothing more crushing to a player or a bankroll than getting to deep into a hand with a losing set of cards. Pai Gow is growing in popularity at casinos, with the one-on-one action between dealer and player much more inviting to casual and new poker players than sitting down with the sharks in stud or hold’em poker. Pai Gow poker asks the player to make two hands from seven cards and create his two strongest hands versus the dealer. 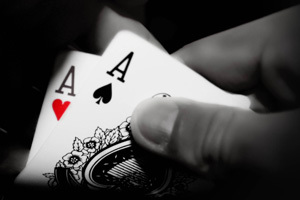 In order for a winner, either the player or the dealer must win both hands. If not, the game is graded a push and the best are returned. It’s this aspect of the game that really tests the focus of players. There are a lot of pushes in Pai Gow poker, which can be frustrating. So, it’s important to keep your cool, enjoy just sitting down and playing a fun game, and always keep your focus. If you play the cards right, you should come out on top in the long run. Jeez, even the name sounds fun. Let It Ride was a popular poker variation in the 1980’s and 90’s but has cooled off in recent years. However, it’s making a comeback with the popularity of online casinos. Let It Ride has the player placing three bets across the table and “letting it ride” to the next bet if they feel positive about their hand. One strategy for Let It Ride is letting circle one bets ride if your first three cards are: three of a kind, a pair of 10s, any three cards for a Royal Flush, open-ended straight flush. You can let the second circle bet ride if your first four cards are: pair of 10s or higher, three of a kind or four of a kind, and any four cards of the same suit. Being able to bluff is not only about keeping a “poker face” and being aggressive with your play and bets early into a hand. Knowing who you’re bluffing is just as important. If you have an aggressive style of play to begin with, your big-bet bluff may not spook off the other players. And if you’re a patient and careful player, a sudden shift in gears could give your buff away. You have to ask yourself if the guy you’re bluffing is wise enough to: 1. Pick up on any changes in play. 2. Wise enough to fold and buy into the bluff. Experienced players are often times easier to bluff because you know they don’t mind surrendering a hand if they think you have them beat. An inexperienced player may not know to pump the breaks and could end up calling your bluff, only to look like a genius after beating your weak bluff hand. Pulling an Ace in your hole cards does put you at an advantage, but sometimes players can get overexcited when it comes to that edge and bet themselves into a bad hand waiting for a pair to show up on the table. Experienced players will back down if it doesn’t look like a strong hand is going to show up, but newbies can often bet too big into a pot and get caught with a losing hand after opponents call and put a price on that Ace. Pulling a pocket pair is often times an instant winner, but if you do end up saddled with a low pocket pair – seven or lower – you can often times over bet pre-flop and lose when an opponent draws a higher pair on the table. Don’t over-invest on small pocket pairs. Rather, you should slow play pre-flop and then scan the possible outcomes once the flop rolls out. If there’s a chance an opponent could finish with a higher pair, pace yourself and read the table and the pre-turn bets. If most players are checking, your low pocket pair might be strong enough to hold up. Before a single card is dealt, set your betting bankroll for the night. 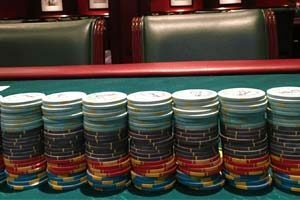 Know the buy-in and the buy-back if you plan on playing long, and try to stick to your budget when playing: win or lose. Too many times, players go well beyond their depth after a bad game and find themselves chasing losses and buying back into games that haven’t gone their way. Losses could be due to bad cards or bad play, but it could also be due to the competition at the table. If you find yourself swimming in shark-infested waters, there’s no shame in taking your loss – and hopefully some valuable lessons – and walking away to fight another day.